There is something magical (or miraculous) about racing a machine 40, 50 or even 75 years “young” on a race track - particularly a machine with a racing lineage. 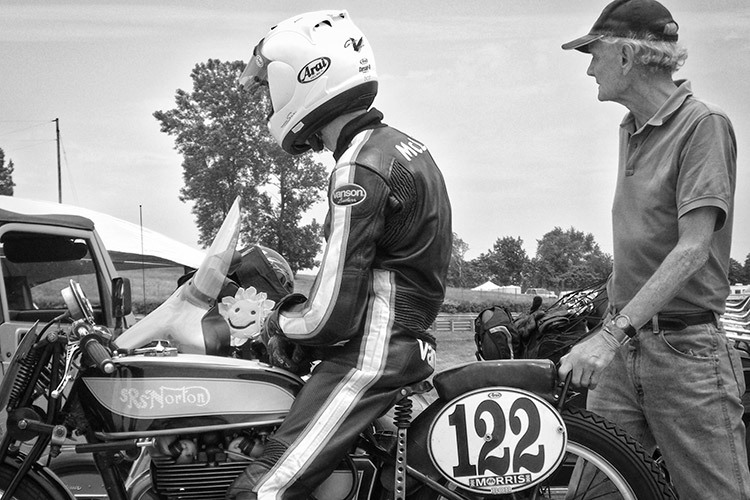 The American Historic Racing Motorcycle Association is the largest vintage racing association in the U.S. with more than 3,000 members. Competition levels at an AHRMA event range from spirited, but not life-threatening, to all-out hair-on-fire racing at lap times not far-off modern machinery. 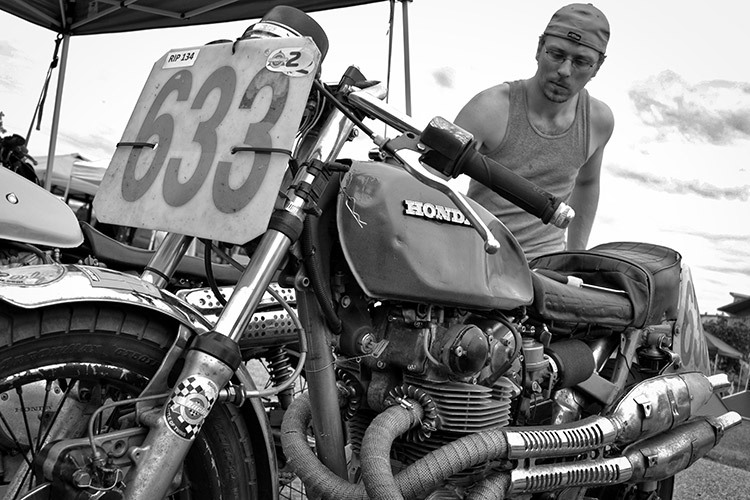 In addition to the photos of the roadracing series in this gallery, AHRMA conducts other vintage racing series in cross country (enduro), motocross, trials, and dirt track. In a forward-thinking twist on its role in matters of motorcycle history, in 2016 AHRMA added a racing class to promote the future of racing - eSuperSport - for modern electric motorcycles. Vintage racing has many faces. Grizzled veteran racers on classic machinery, young riders fascinated by competing on bikes from the pages of popular racing history, racers attracted to competition on affordable motorcycles and a close-knit community, collectors campaigning rare and valuable machines because their passion says it's the best way to preserve racing history - not just the mechanical bits. Nobby Clark (right), famed race tuner and Isle of Man veteran, prepared many Honda GP-winning bikes in the 1960s for Jim Redman and Mike Hailwood. Nobby waits for the grid call with Alex McLean (Norton Champagne Bob Racing Team) at Grattan Raceway in 2011. Nobby Clark passed away in 2017. David Roper is the only American to win a race on the Isle of Man circuit, riding a Matchless G50 in 1984 in the IOM Classic TT. He competes internationally and is a frequent rider for the Team Obsolete organization that campaigns a large stable of rare racing machines. Here he applies generous pre-race attention to his personal 1953 Moto Guzzi 350cc Airone Sport. 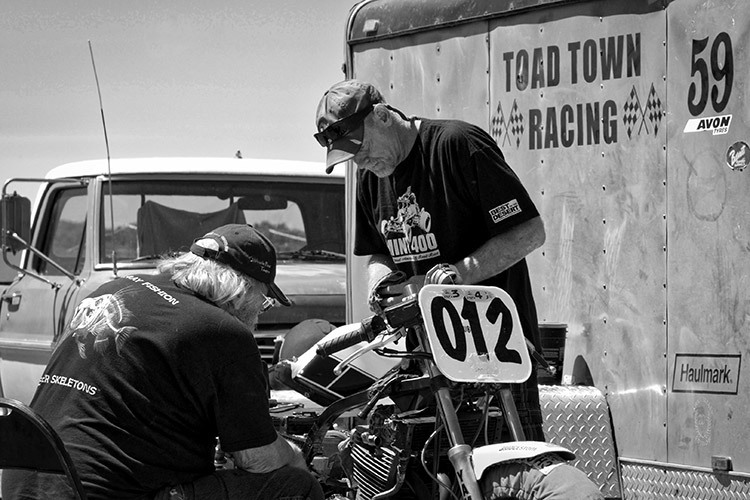 Terry Naughtin’s story of the rebirth of Team Hansen is an inspiring tale of personal commitment to preserving a significant chapter of moto-racing history. 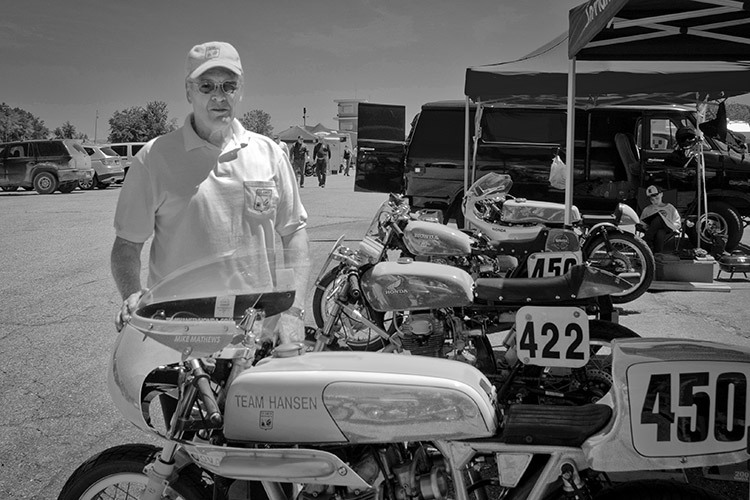 In 1998 Mr. Naughtin, a successful vintage racer, had a chance encounter with legendary racer, tuner and AMA Hall of Fame inductee, Bob Hansen. 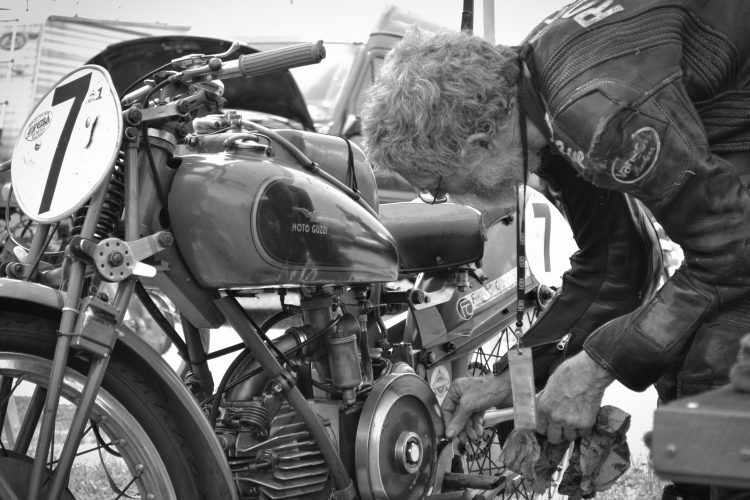 Among his many (many, many) accomplishments, Mr. Hansen is known for tuning the all new Honda CB750 four that won the 1970 Daytona 200 in its very first year. By 2001 Naughtin and Hansen had agreed to build and race replicas of Hansen’s 1967 Honda CR450 racers. Terry Naughtin campaigns them with great success, winning multiple AHRMA National Championships - keeping the Bob Hansen story alive. 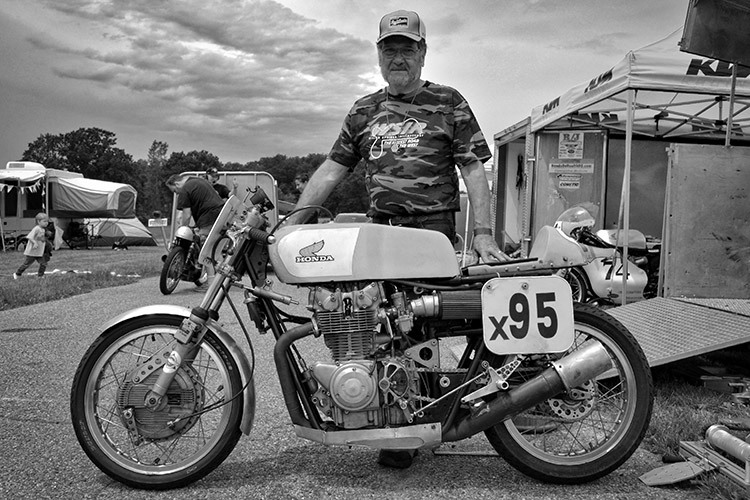 He stands with a replica of Swede Savage's 1967 Daytona racer. Vintage or no, competition is competition. 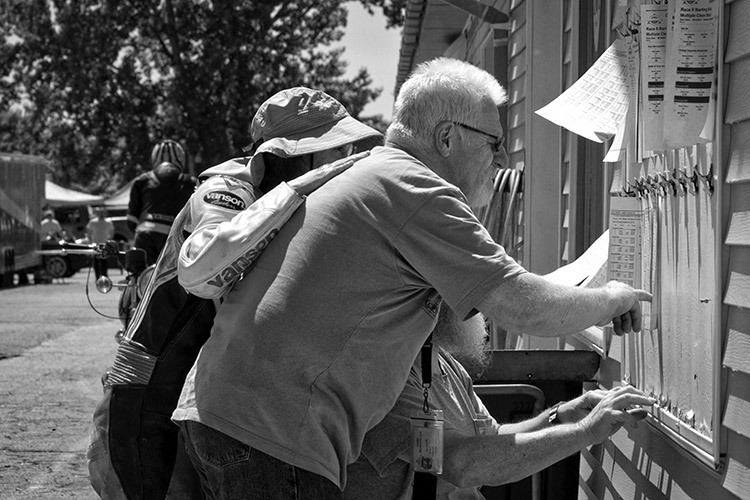 AHRMA racers check their qualifying times and grid positions. 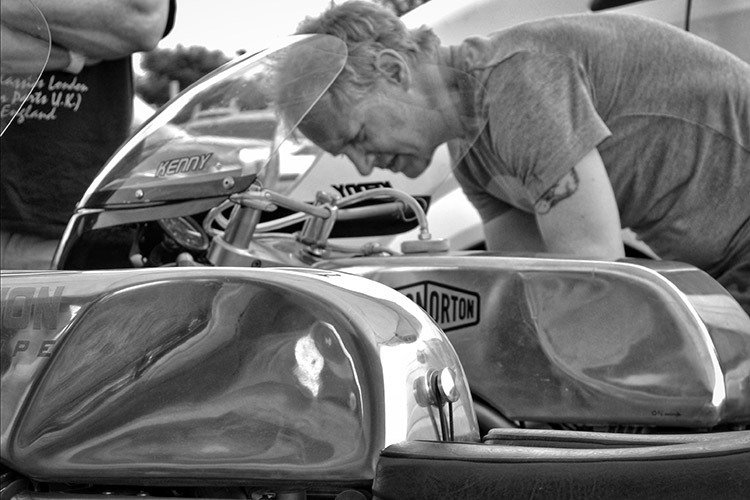 Kenny Cummings, founder and proprietor of NYC Norton, preps one of the shop’s Nortons - part of a stable that began when he restored a 1974 Norton Commando 20 years ago. He has since campaigned the shop's bikes to four AHRMA National Championships. 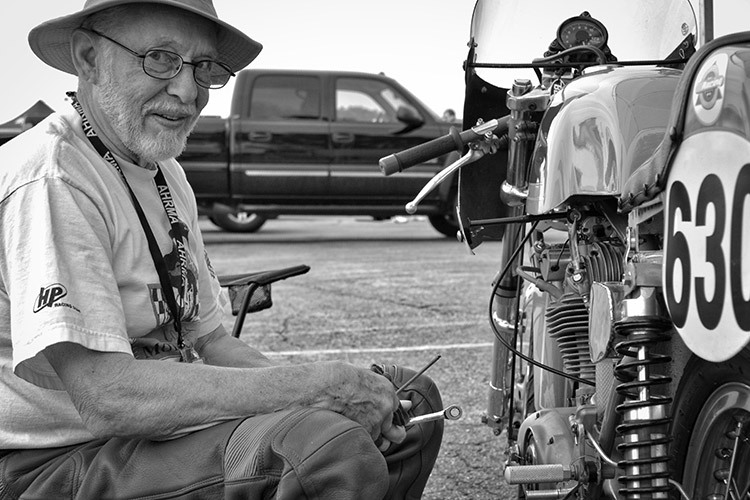 Mr. Cummings now operates one of this country’s most prolific and successful classic motorcycle restoration businesses specializing in vintage British Twins - chiefly Nortons. Available in high-performance street trim, custom or racing spec. An NYC Norton build was picked a Bike EXIF Editor’s Choice Top 10 Custom for 2015. 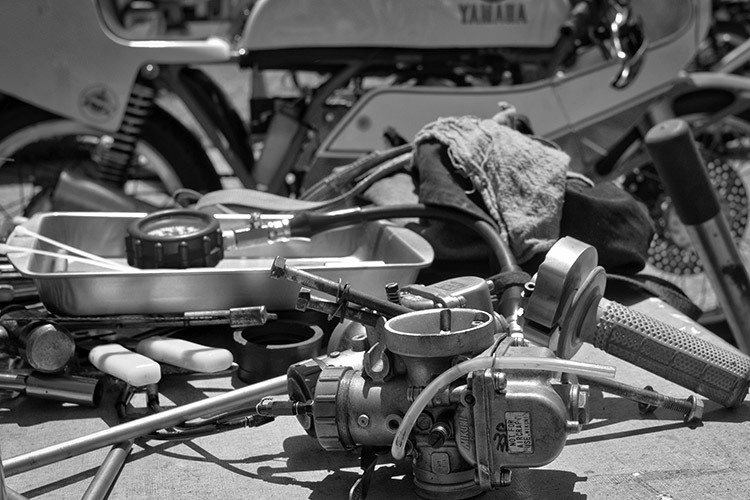 Keeping a 40-year old machine in racing trim is a continual cycle of inspection, tuning, repair, surfing the ‘net for information, hanging out at swap meets for parts, long sessions of bench racing, and occasionally getting up to race speed on the track. Worth it - every bit. The culmination of hundreds of hours of work, this Honda CB450 has been restored and spec’d out for racing with a choice selection of high performance parts. Not all are Honda OEM bits (the front brake is from a Yamaha) but if period-correct, it will be given a pass. Maybe not hundreds of hours of work invested here, but all the same aspirations for competitive fun with an honest set of priorities. In the paddock awaiting the return of machine and rider - and the next adjustment.